I'm so impressed with the length of time that they are blooming. It seems they've been showing their bright yellow faces for months. 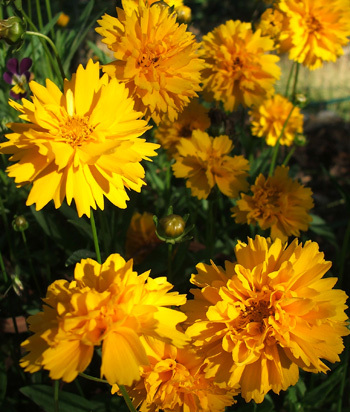 Nurseries will label Coreopsis as a perennial, but I find in my garden that it can be short-lived. And it's so easy to sow from seed that any plant loss shouldn't be a problem. The common name is tickseed, which according to my Google research is derived from a Greek word for a bedbug. Aargh!